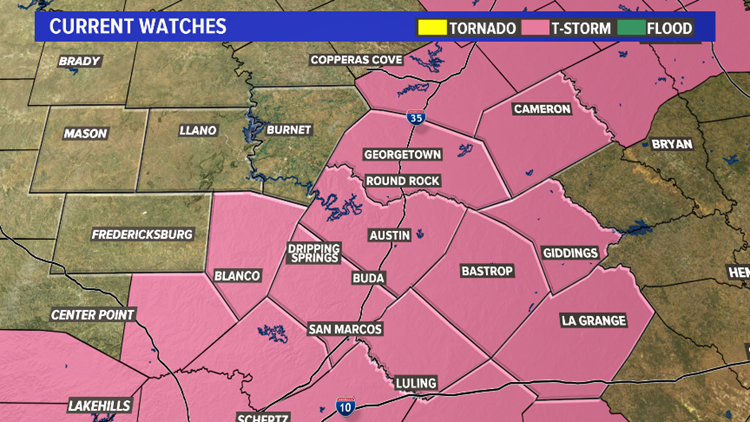 A severe thunderstorm watch was issued for much of Central Texas. AUSTIN, Texas — A strong upper-level area of low pressure moved through the state on Wednesday, allowing for another round of numerous showers and thunderstorms, some of which were strong to severe. 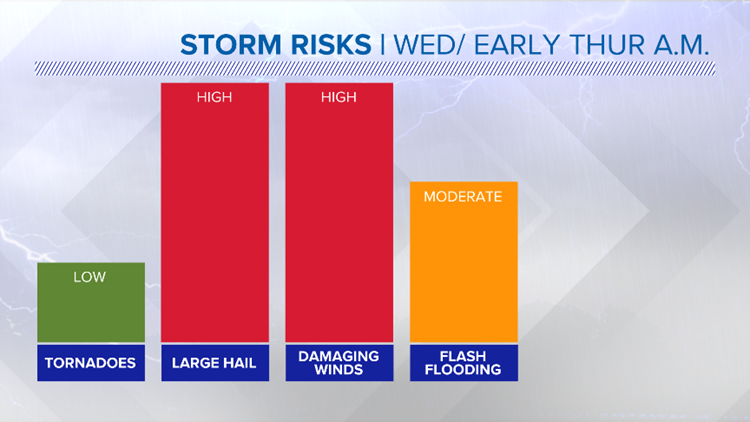 The Storm Prediction Center issued an "Enhanced Risk" for severe weather (3 out of 5 on the severe weather scale) for most of the area, including the City of Austin. 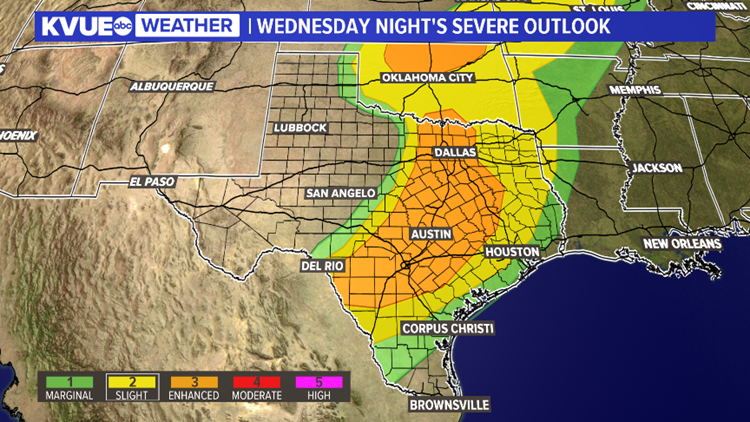 A threat for severe storms arrives for Central Texas Wednesday night. Large hail, quarter to golf ball sized, was the primary threat, along with severe storms producing damaging winds. Watches were issued for tornadoes, but there were no reports of any. Heavy downpours could also trigger street and creek flooding. Timeline: A severe thunderstorm watch was issued for a majority of the region until 2 a.m. with damaging winds and large hail possible. Storms will continue to move through the area, but much of the severe threat has now moved east of I-35. Expect heavy rain to continue for much of the area throughout the night, but the severe threat shifted east at about 2 a.m.
Rainfall amounts of up to an inch and a half will be possible, with isolated higher totals. 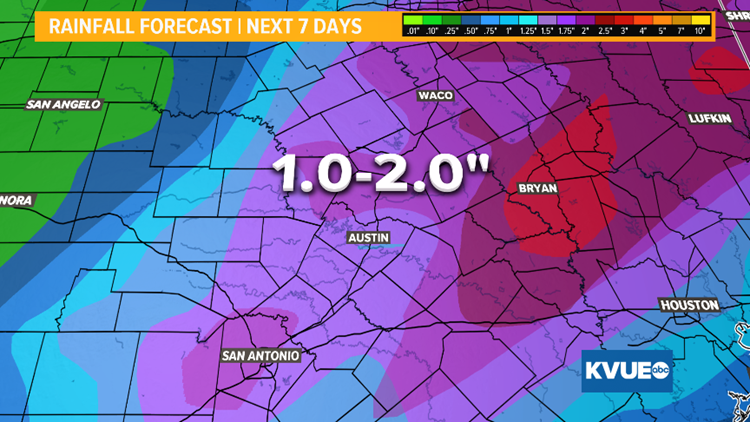 Stay weather aware with the KVUE Storm Team as confidence builds in the days ahead. Also, be sure to prepare your "safe place" in your home or work in the event of a weather emergency. The highest threats for severe weather tonight were expected to be damaging winds and large hail. 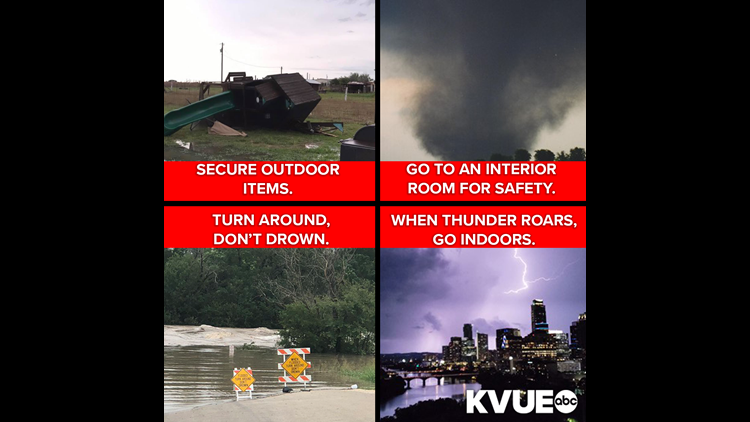 Make sure to download the KVUE app so you can get the latest information wherever you are. 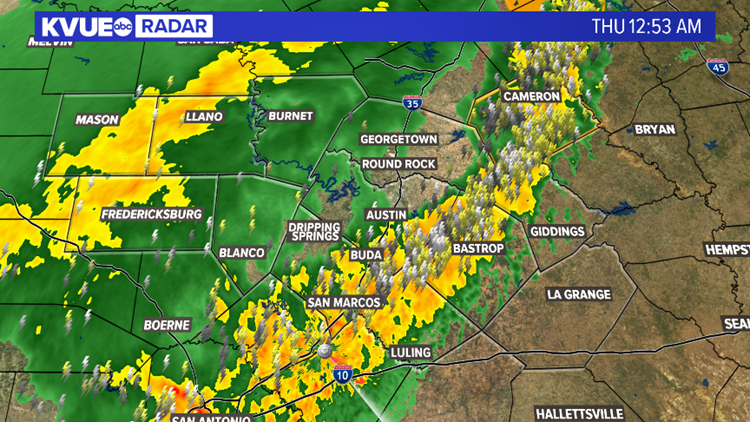 Stay up to date on the weather by downloading the KVUE News app now. And follow KVUE on Facebook, Twitter, YouTube and Instagram for updates. How's the weather where you are? Send your photos and videos to news@kvue.com.